I really like the PCLINK support This version seems to working much better than the previous versions..
AtariAge does not allow for the *.dmg file extension, so I compressed it before uploading. Could you please upload them to the Github release? I just gave your RPi build a run on my RPi Zero W and it seems to be working great. Booted up Zork I at 125,000 bps perfectly. Thanks as well for building OS X binaries. Since my MacBook Pro died I haven't been able to do that for uploading to the GitHub repository anymore. Did you definitely give up your MacBook Pro? No replacement from Apple planed so far? I purchased my Minimac mainly to be able to test new RespeQt features on all platforms. Regarding the Raspberry Pi binaries I realized that I forgot to modify a path to the RespeQt icon in the RespeQt.desktop file. It is not a big deal, since it is an optional file. If you copy it to the Desktop (Drag&Drop), you can double click it on the Desktop to start RespeQt. For the record, this has been updated on github now. 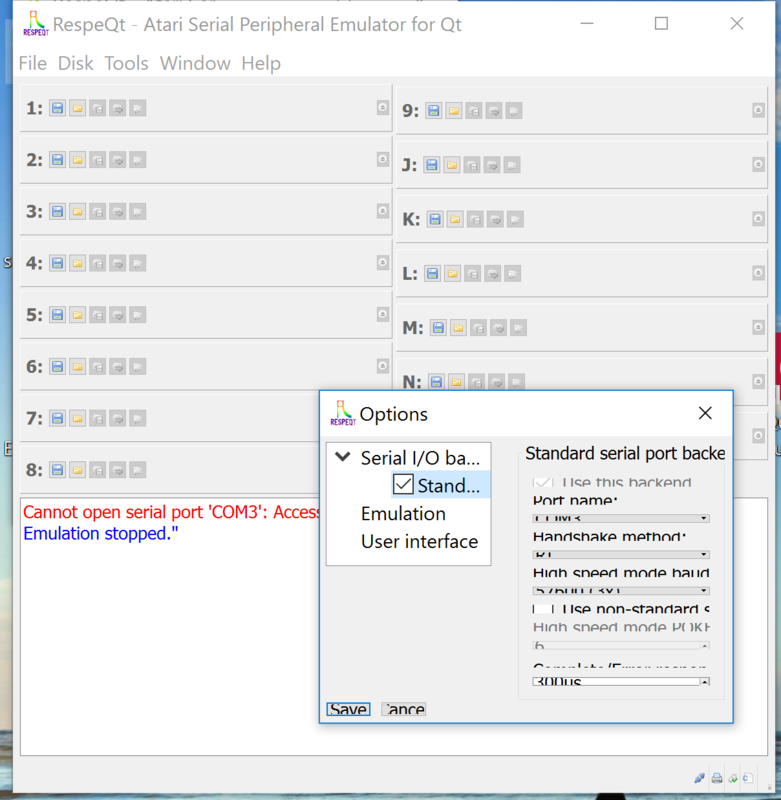 I annunced the released RespeQt r4 version on the atari.org.pl forum and already got some feedback. For example all the debug logs contain escape characters for languages with special characters. I will try to resolve it and report here the results. But I wondered generally about how are we going to proceed. Right now there are two branches and the developer branch is ahead with several commits. Are we going to release something like r4.1 only with bug fixes to reported issues (and integrate these bug fixes also into the development branch)? Or we freeze r4 and develop towards r5? I would suggest the former, i.e. fixing main branch and merging into development. Thanks for this. On my 3200 x 1800 laptop the icons are really tiny, but the options screen is a real mess. Windows 10. Edited by dkerfoot, Wed May 3, 2017 1:57 PM. On my Macbook under Win10, I get the same look. There seems to be some HiDPI mode in Qt5, but I couldn't get it to work resp. making a change. In Win10, right click the RespeQt executable, select Properties. 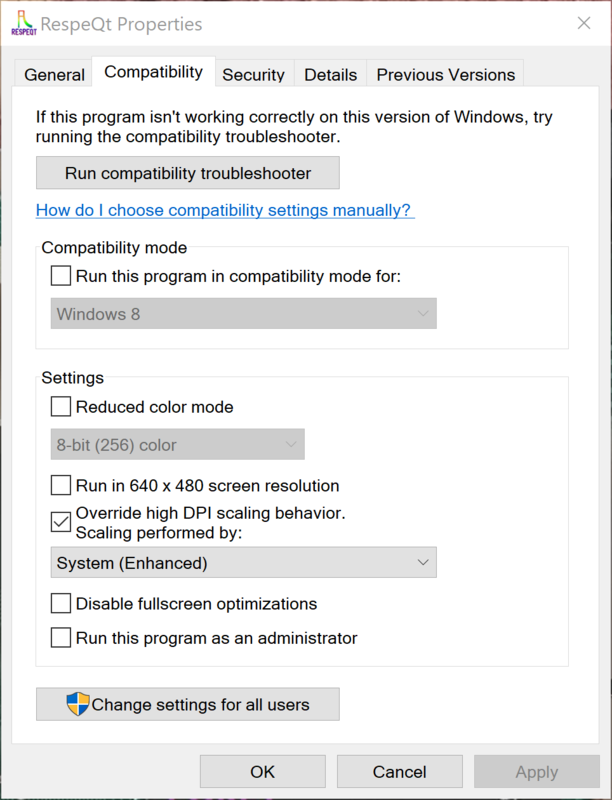 From there, click the Compatibility tab and check the option "Override High DPI Scaling Behavior" - You may have to play around with the options provided with Windows, depending on your graphics card. With an Nvidia GTX 1070, this setting gives me normal-sized icons. Now, that you say that, it comes back my mind. It's a nice workaround, but it would be nicer to get RespeQt behave well in HiDPI environment. In Win10, right click the RespeQt executable, select Properties. From there, click the Compatibility tab and check the option "Override High DPI Scaling Behavior"
My options are a little different. The only thing close is "Disable display scaling on high DPI settings." Selecting that makes no difference. I have no idea how Win10 handles scaling stuff like that, I'm just glad it works on my system with a 4K screen! I suspect there's gotta be something in Qt that defines or determines at least part of this. Yes, as I said: There is HiDPI support in Qt5, but I couldn't get to work. I decided this was the model we will follow, for the moment (no one objected) in which 'critical' bugs get fixed in master, in this case, and then merged into develop. Now, RespeQt probably doesn't have to limit this to critical bugs, so for the moment, bugfixes get merged into master, and then into develop subsequently. EDIT: actually I think this should be merged into the r4 branch. However, as I've already deleted the r4 branch, that'd require some work, so for the moment merging into master is fine. For the future, I'll wait to delete the release branch until the next release is considered stable. Also, at some point I'd like to consider migrating to a new versioning scheme. The integer-release-number worked when it was just me working on this, and I did releases when I felt like I had something done. Clearly, that's not going to work as well here, but for the moment I suppose we will add a decimal place for bug fixes, that seems fine. Perhaps we can classify that as good enough, and consider it the new standard. Edited by Joey Z, Thu May 4, 2017 8:15 PM. But I quickly found something in the internet (and created a pull request still for R4/master). Initially the changelog said that "All characters that aren't printable in US-ASCII are escaped (this includes printable Unicode characters outside of US-ASCII)." For the icons, I'd say check the main window source code, and you'll see maximum and minimum sizes are fixed at 28 pixels. Removing the limits should fix the tiny icon problem on high res screens. This relates to the Mac OS X build. Not sure if this is a redundant or false error report, but I find that printed output comes out with Arial regardless of which font is selected in the lower right drop-down menu in the Printer text output dialogue. Is it possible to build a version for Macintosh that supports 32-bit systems. I have an old mini running 10.6.8 that I'd like to run it on. I'm sure it should compile and run under 32 bit OS, but I can't help other than encouraging you to install Qt on you MAC and compile it from the source code.